Boomerang Tool Company "The Snip"
ACCESSORIES → Tools & Equipment → Boomerang Tool Company "The Snip"
The Boomerang Tool Company has come out with this revolutionary fishing line cutter called "The Snip". This tool has stainless steel jaws that cut clean and smooth everytime, great for braid, fluorocarbon and monofilament line. 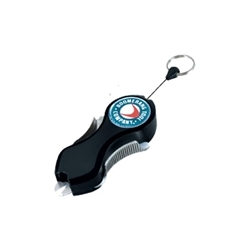 The Snip includes integrated blade safety mechanism and attaches anywhere you need it with a retractable cable. These Snips are indispensable for any angler and have been tested for repeated cuts on braided line up to 50lb test.